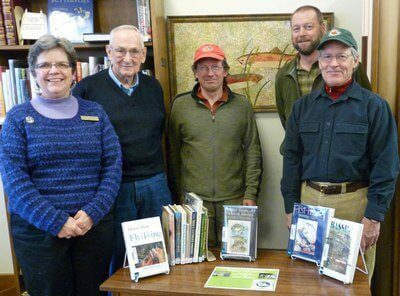 The Iowa Driftless Chapter of Trout Unlimited and the Decorah Public Library have embarked on a partnership to establish a signature collection of fishing books. The purpose of the partnership is to provide the community with a high quality collection of books attractive to fisherpersons of all levels and to those interested in taking up the sport. The Iowa Driftless Collection focuses on fishing in the Driftless area. The Driftless area includes northeast Iowa, southeast Minnesota and southwest Wisconsin. The collection focuses primarily on books about trout fishing; books related to other fish in the area, including small mouth bass, are also included. The material in the collection not only serves all Decorah residents but is available to all Iowa residents through the interlibrary loan program. The collection includes books that are regarded as classics in the field as well as newer books that have received favorable reviews. DVDs are also included. The material in the collection covers a wide array of topics related to fishing such as equipment, getting started, fishing small streams, fly casting, fly tying, conservation and stream improvement, entomology and more. The partnership represents a three-year commitment between the Decorah Public Library and the Iowa Driftless Chapter. The Iowa Driftless Chapter purchases and donates books, DVDs, and other nonprint material to the collection. The library catalogs, distributes, and maintains the collection. Together, they provide the community with a premier collection of unusually desirable material on fly fishing not generally available. The collection, as a work in progress, will continue to expand over time. Donations of appropriate topics related to fishing from chapter members and friends are gratefully received. Books may also be given in memory of a friend or family member. All of the material in the collection is identifiable by a faceplate inside the cover of the book. Appropriate donations of fishing books for the collection may be received at the front desk of the library; please notify library staff that materials are meant for the Driftless Collection. Materials deemed unsuitable for the Driftless Collection will be placed on the Friends of Decorah Public Library sale table, with proceeds benefiting the library. Contact Decorah Public Library Director Lorraine Borowski for more information: 382-3717. Learn more about the Iowa Driftless Trout Unlimited chapter < HERE >.